Working with health and community services, the program aims to reduce the physical, social and financial impact that smoking has on disadvantaged populations, often bringing them further into personal hardship. Organisations that service disadvantaged populations are perfectly placed to create positive change as they have existing connections with these populations, are committed to improving their wellbeing and are familiar in promoting positive behaviour change. Training and follow up: Training, upskilling and increasing staff confidence to address smoking as a part of everyday client support. Time: Take time to understand the program's ‘ins and outs’ and how you will implement it within your service. The program will involve making changes to workplace policy, processes and culture, hence it is important to carefully consider your approach. Plan: Solid planning is the foundation of the project and is important for its sustained success. Plan who to involve, how to involve them and what resources are needed. 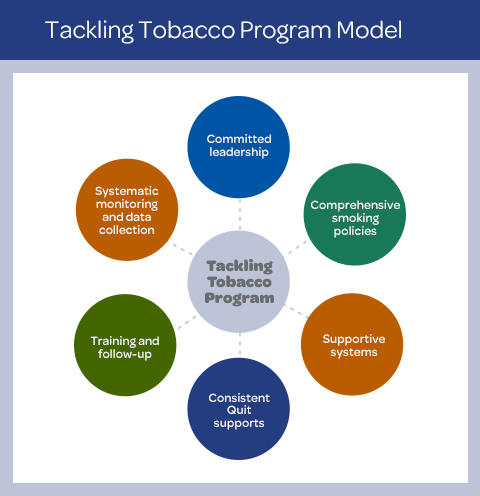 Cost: Our Tackling Tobacco tools and resources are free to download and use. Quit Victoria may also be able to provide training for free or at a subsided cost. It is also important that your service considers the cost of administration, staff time, additional training or the cost of smoking aids such as nicotine replacement therapy products.